We wrote back in March about Bell planning to impliment 20 new cell phone towers in Cottage Country that look like trees. 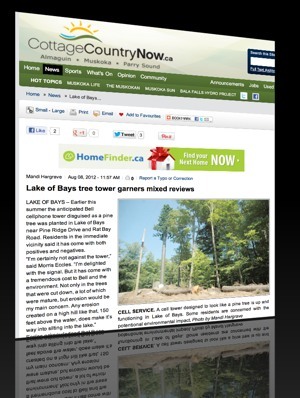 CottageCountryNow.ca wrote an article a little while ago about the new Bell cell tower that looks like a very tall Pine tree. According to their article, it is getting mixed reviews. If you're looking for a chuckle, check out just how many cell phone towers there are in Canada.